A season of renewal and rejuventaion, a season of togetherness, a season of growth, a season for love. That's what comes to mind when I think of summer. It is a time for the sizzling sun to embrace my arms, a time to hear little arms splashing in the pool, a time to feel the flutter of excitement about holidays and a time for indulging in seductive foods. But my definition of summer keeps fluctuating. Up until my teens, summer signified freedom and a time to discover a new world, the unknown. Me and my sister would spend two months of our summer holidays with my grandparents in London. Everything about London was a stark contrast to home- Dar es Salaam. We loved the fresh cold air, the quaint houses where you could hear your neighbors brushing their teeth if you listened hard enough, the long walks in the park with dew beneath our feet, the sweet smell of my Grandma's roses, the numerous shopping trips to the city, the joy at feeding the ducks- there are just too many memories to list here. But my most vivid memories of summer holidays are intertwined with food. I loved losing myself in the supermarket aisles, admiring the luscious berries, the furry peaches. The fresh smell of washing up powder drew me, the rows upon rows upon rows of cereals enthralled me. You see, Dar es Salaam at that time never had supermarkets! I was in heaven. I still am every time I visit this city- Sainsbury's is usually my first pit stop. London truly was the city of dreams. It is where I learnt to ride a bike, where I bought my first Barbie, where I longed to be a ball girl in Wimbledon, where I ate my first peaches. That baby soft skin, that juicy dribble down my arms, that delight at finding a huge stone in the centre. I still remember. So in keeping with summer, in keeping with peachy first and in keeping with London- here is a creamy dreamy peach ice cream recipe with a raspberry swirl. Where is the London connection to the recipe? It's my grandfather's ice cream recipe. He lives in London and apparently made the best ice cream according to my Mum. Then there's also the memories of the musical ice cream van whom I first encountered in London. But I'll leave that for another blog post! This is my submission for Monthly Mingle this month which I'm hosting. The theme is stone fruits. Preheat the oven to 180 degrees Centigrade (I turned it on the grill function). Combine sugar and vanilla. 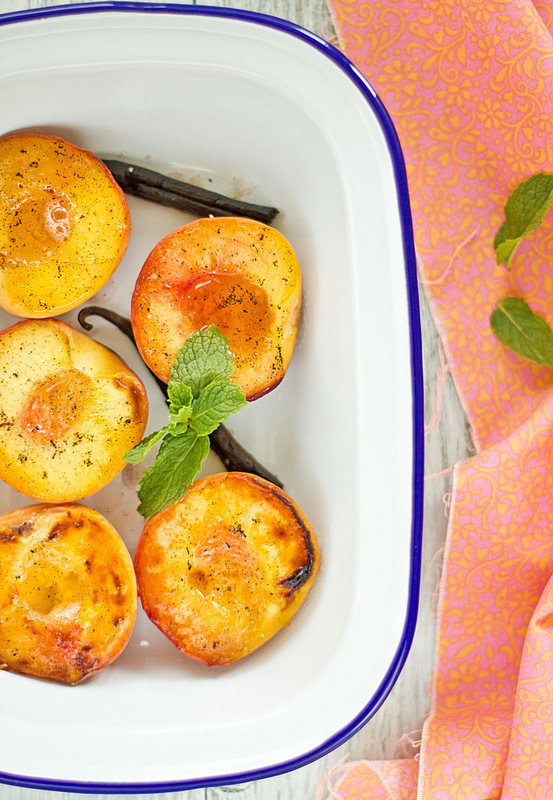 Arrange the peaches skin side down on a baking tray and sprinkle with the vanilla/ sugar mixture. 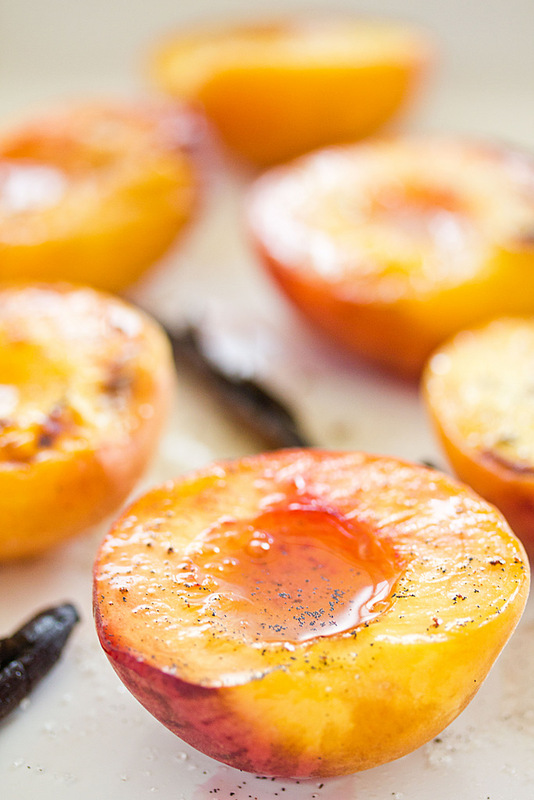 Grill in the oven for 10 15 minutes or until the top of the peaches appear caramelized. Remove the skin from the peaches as soon as it is cool enough to do so. Puree the peaches and any juices in the baking tray in a blender. 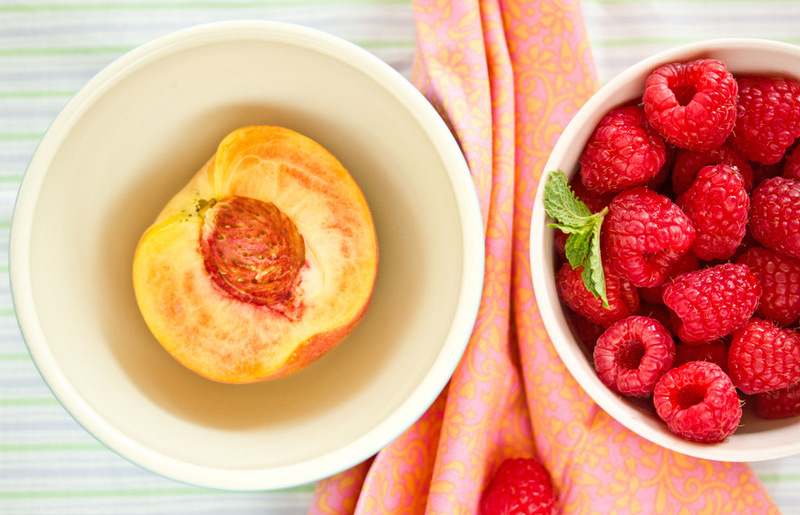 In a separate bowl, combine the raspberries and sugar and set aside for a while. Blend the mixture. In a separate bowl combine, the cream, milk, condensed milk and peach puree. Churn in your ice cream maker according to the manufacturer's directions. Freeze the ice cream in a baking tray for half an hour. At this stage remove from the freezer. The ice cream should just be starting to set. Spoon the raspberry mixture on top and use a toothpick to make swirls. Freeze the mixture wrapped in clingfim overnight. 1) The ice cream batter always tastes less sweet after it has set. So make sure the batter is just slightly over sweetened before churning. 2) The higher the double cream content, the creamier the ice cream will be. 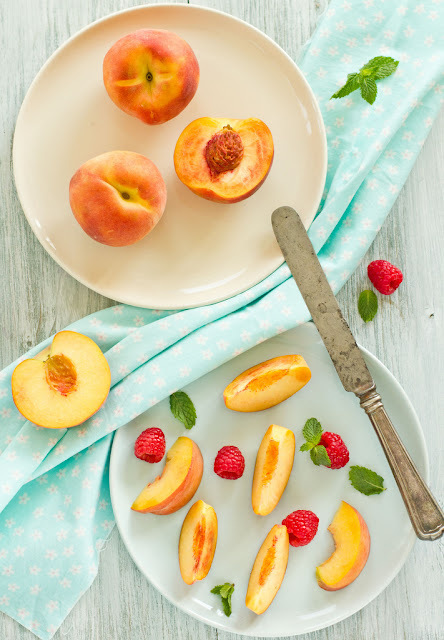 3) For a more distinct peach flavor, increase the number of peaches. Using the above recipe, the peach flavour is subtle. You can also consider adding a peach extract for a stronger flavour. Saving this for my summer in 5 months time  thank you. Gorgeous photos n yummy looking ice-cream. That ice cream is so beautiful and must taste just divine! Perfect pics. Aww it was a success afterall. The ice cream looks fabuous and the swirl so pretty. Yay, you! Delicious! Did you get around to making any of those pops with the leftovers? yay! your icecream was a success and it looks absolutely divine. You inspired me to try again. This time I'll go with a simpler recipe and yours look perfect! You are such an inspiration to me. And I love traveling the world through you! What an incredible ice cream! Thank you for sharing the recipe! That ice cream looks incredible. By the way your pictures are lovely. Oh my gosh, that looks perfect! LOVE the red popping swirls in the ice cream. You did a great job Sukaina as always! Your photos are stunning. 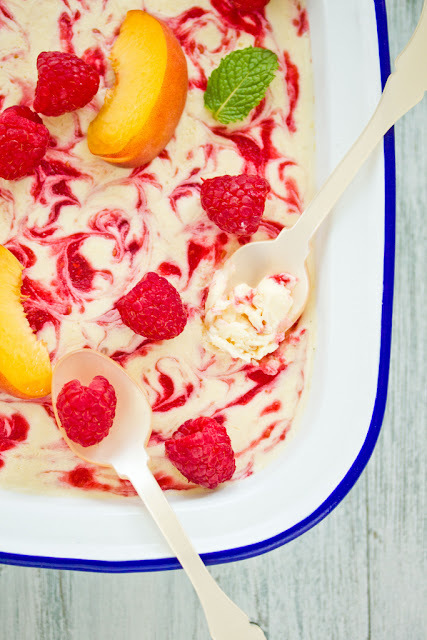 I just want to dive in and devour this (even though I'm actually in London and it is cold and grey and not ice cream weather - but it's those rasberry swirls, they're so tempting). All summer I've been contemplating whether or not to get an ice cream maker. This is so pretty, the colors and I'm sure the taste is incredible. The photos are extraordinary. There's so much I can learn from just looking at your photos.. Spectacular. Those swirls look so perfect Sukaina...pretty red and peachy..I think I m going to try this one out for sure..shouts summer to me! Your photos Sukaina are just absolutely breathtaking and that ice cream looks SO good!!! So reminiscent of summer, which I am sorely missing here. Those are some wonderful pictures, love the swirls! Meant Grand dad ...sorry for the typo S! Stunning Photography. I love the brilliant play of colors and lovely writeup. I have similar memories of my childhood summers in France with my grandparents and fruit was always such a pleasure during that time. 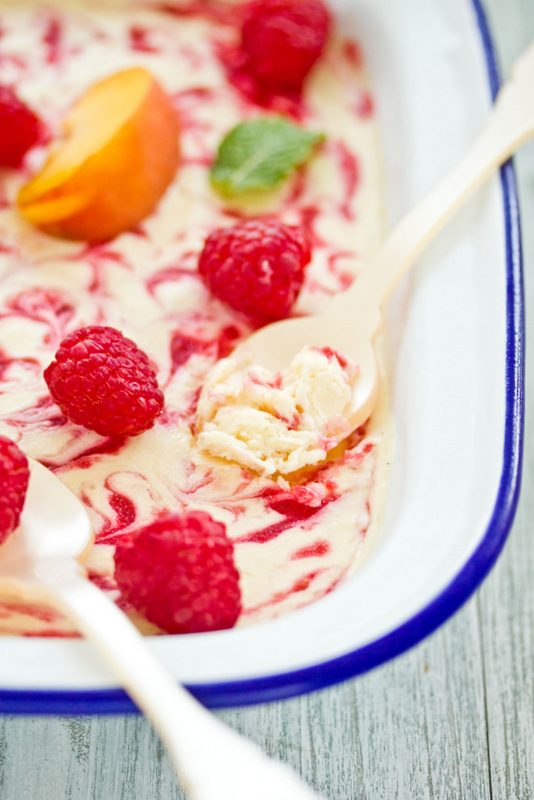 I love the beautiful raspberry swirls in the ice cream! OMG stunning photography. Colourful, summery, sweet and beautiful. These photos are bringing sunshine to my today because the weather is cool and not sunny in Budapest right now. Thanks everyone for coming here and leaving a comment. It's so nice to read your thoughtful comments. Great looking ice-cream!! I am deep in winter (so cold! ), but I want this! Prefect pic for prefect ice cream! I love the fact that you find Sainsburys inspiring - I would find Dar es Salaam so fascinating, to see the markets and the spices and the way that people eat. I just can't imagine Sainsburys holding the same allure, but I suppose that what is different to what we know is interesting. I love your bright, happy photographs, they have put me in a lovely, summery mood. visiting ur blog for the first time..u sure do have a lovely space. 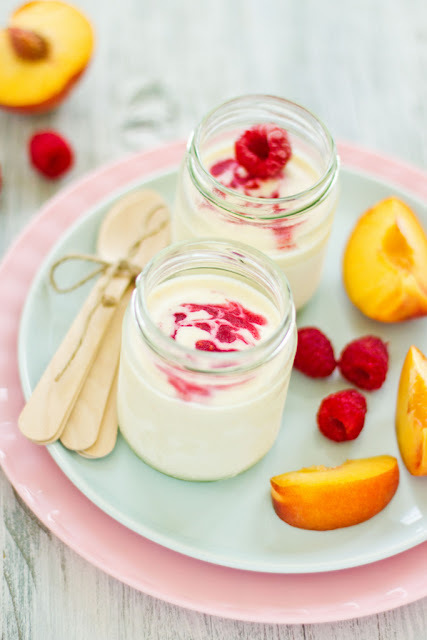 great pics with very nice recipes..
ice cream cliks are darn cute..looooooooove it..
As an ice cream lover myself, this recipe is absolutely beautiful! Your photos are terrific and makes me want to try this recipe on my blog www.365scoops.com very soon! I'll keep reading for more of these amazing concoctions. Thanks for your reply! Your blog is absolutely wonderful and your pics sooooo pretty! So sorry I couldn't mingle with you - I really wanted to and even bought the peaches (from Sainsburys!). My daughter ate the peaches and the preparations for 3 family birthday celebrations just got overwhelming. 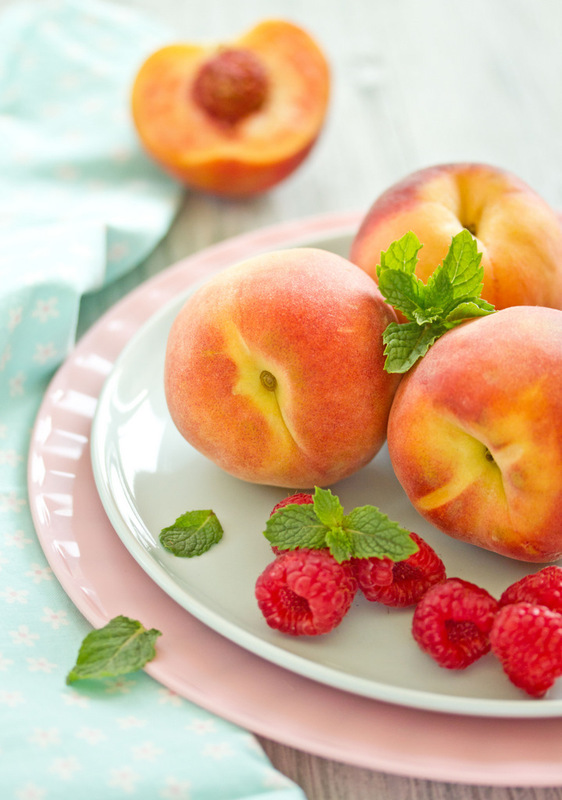 Gorgeous peachy pics. Oh Sukaina - these pictures are making my eyes smile!!! Absolutely delicious. I love all these photos - everything looks delicious! realy nice informations this posting artikel I bookmaks,can see my blog tozca several a few other then that is no motive to never provides it.